From top: Gabby with fellow presenter Clare Balding; with Lord Coe; with dad Terry Yorath; mum Christine; Gabby in glamour mode, modelling a swimsuit and in a red dress in Strictly Come Dancing; dad Terry in his playing days; Gabby with husband Kenny, a Scottish rugby union international. GLAMOROUS Gabby Logan, Britain’s best-known female TV sports presenter, comes across on our screens as the classic English rose. However, the blonde beauty has a family history that is truly multi-national. She was born in Leeds to a Welsh international soccer player and his wife, a Yorkshire lass, and is married to a former Scottish rugby union international, Kenny Logan. But there’s more to Gabby’s pedigree than her UK roots. On her mother’s side she had Irish ancestors who went across the Irish Sea to Leeds in the 19th century. And, through a pair of great great grandparents on her paternal line, she had forebears from Greece and America . A keen sportswoman when growing up, she represented Wales as a 17-year-old gymnast at the Commonwealth Games in Auckland, New Zealand, in 1990. She was one of the major presenters of the London 2012 Olympics coverage for the BBC and is a fantasy woman for millions of male football fans watching Final Score on Saturday afternoons. However, though she’s enjoyed huge success in television, Gabby has known her share of tragedy. She lost a younger brother who was only 15 from a fatal heart condition and at the age of 12 she and her parents survived the terrible disaster at Bradford City in 1985 when fire engulfed a wooden stand, claiming 56 lives. She was born Gabrielle Louise Yorath on 24 April 1973 in Leeds, daughter of Welshman Terry Yorath and his Leeds-born wife, Christine Kay, who were married in Leeds in 1971. At the time, Terry was playing for the then mighty Leeds United team who were First Division champions in the 1973-4 season. The family moved around a lot, including to Vancouver, Canada, as Yorath played for a number of clubs and also won 59 caps for the Wales national team, captaining his country 42 times. After retiring as a player he managed a number of clubs, as well as the Welsh national side. Gabby’s father was born Terence C. Yorath on 27 March 1950 in Grangetown, Cardiff, son of David Charles Edward Yorath (1918-1999) and Mary Margaretta Sigallias (1918-2004) who were married in 1939, just a few weeks after the outbreak of World War II. Remember the surname of Gabby’s grandmother, Mary Sigallias, because it will crop up later and we shall meet her ancestor, a great great grandfather who brought the name to Wales from Greece in the 1880s. The Yoraths were in Cardiff for as long as I have been able to trace the family, back into the early 19th century. For much of that time they lived in the poorest parts of the city, close to the docks area, and knew deprivation and poverty. Indeed, a great great grandmother, Clara Yorath, had a desperately sad life. David Charles Edward Yorath, Gabby’s grandfather, was born in Cardiff towards the end of 1918, the son of David James Yorath and Edith Magee who were married in the first quarter of 1918. Her great grandfather, David Yorath sr (1895-1967), served in France in World War I with the Cardiff City Battalion of the Welsh Regiment, joining up in 1915. He is found in the 1911 census, aged 15, living with his widowed mother Clara, 41, and younger brother William, 11, in apartments shared with another family at 20 Hewell Street, Grangetown, Cardiff. There are a couple of oddities about this entry. First, the schedule was originally completed by a Thomas Henry Wilkins, of 8 Hewell Street, who I discovered was Clara’s son from her first marriage. However, his name was crossed out and Clara’s substituted. Second, the ‘Particulars as to marriage’ column showed that she had had eight children of whom four had died. This, too, was crossed out; possibly either Clara or Thomas (or the enumerator) realised a mistake had been made and that, as Clara was a widow, this section should not have been completed – though I gave thanks that it was! Finally, a note in the ‘Infirmity’ column revealed that Clara was deaf. Poor Clara’s life appears to have been a sad one. She was born at Cardiff in 1869 or 1870 as Clara Poulton and married at Cardiff in 1887 to Thomas Wilkins. Their son, Thomas Henry, was born the following year. But Thomas sr died in 1890 from pneumonia, aged only 23, so Clara was first widowed at 21. She appears in the 1891 census at 30 Seven Oak Street, Canton, Cardiff, with her son, Thomas, aged 3, both described as lodgers with a couple called Joseph and Harriet Poulton. In fact Joseph and Harriet were Clara’s parents, both originally from Somerset, and also in the household was Clara’s elder unmarried sister Matilda, 23. Clara remarried in 1895 as Clara Wilkins to David James Yorath, Gabby’s great great grandfather, and their son, also called David James, was born a few months later. By the census of 1901 they had had three sons and were living at 3, York Place, Ferry Road, Canton, Cardiff. David Yorath sr was a dock labourer, aged 31, Clara was also 31, and their sons were David, 5, Charles, 3, and William, 16 months. Also living with them was 13-year-old Thomas Wilkins, Clara’s son by her first marriage. 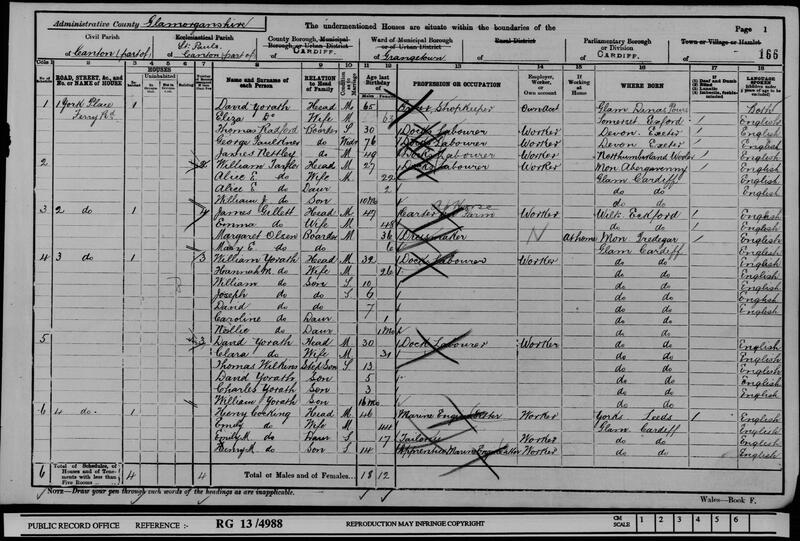 This census entry shows three generations of the Yorath family all on the same page – with no fewer than four of them called David. At 1 York Place was a shopkeeper, David Yorath, 65, with his wife Eliza, 63. Then two doors away was William Yorath, 32, a dock labourer, and his wife Hannah, 26, with five children including a David aged 7. In the same household were David and Clara Yorath with their son, yet another David. I discovered that David and Eliza Yorath were the grandparents, William and David Yorath sr were brothers and the two youngest Davids were first cousins. It was common in Victorian times to find families living close together, but for a genealogist to find 15 members of one family all on the same page of a census can only be described as pure joy! Fifteen members of the Yorath family in the 1901 census, four of them called David. More sorrow struck Clara in 1905 when she was widowed for the second time, her husband David James Yorath dying of tuberculosis at 35. In a documentary on BBC Wales in 2009 Gabby broke down in tears when she learnt that Clara, her great great grandmother, had also lost two children who both died within hours of birth from malnutrition and that a third child had died at just over a year old after being put in a workhouse. Another son, Charles, fought in WWI with his brother David – though the two had lost touch by then – and was killed in 1916. Clara herself died in Cardiff in 1940 after a life filled with much tragedy. Going back to the earlier generations, I found David Yorath, the shopkeeper, with his family in the 1881 census at 4 Ferry Road, Canton. He was then a general labourer, aged 48 (though in 1901 he was shown as 65, a discrepancy) and his birth place was Dinas Powis, a village about five or six miles south of Cardiff. David’s wife Eliza was 46, born at Watchet, Somerset, and they had six children ranging in age from 13 to six months, including William, 12, and David, 10. Also in the household was William Mogford, 30, also born at Watchet and a relative of Eliza – whose maiden surname was Mogford – and William’s wife Mary Jane, also 30 and born at Bristol. David Yorath and Eliza Mogford – Gabby Logan’s great great great-grandparents – married at Cardiff in 1864 and in the 1871 census were in Llandaff parish, Grangetown, with their address given as ‘Row of Houses near Railway Hotel’. 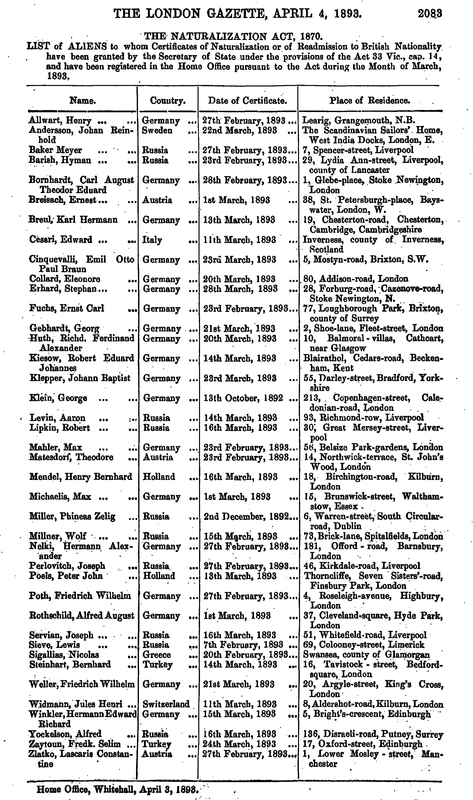 As well as the three eldest children who were with them in 1881, there was an older son, Charles, aged 6, who died soon after the census since the GRO death indexes show a Charles Yorath who died at 6 in the last quarter of 1871. David Yorath the elder outlived his unfortunate son David, who died at 35, by some eight years, dying in 1913 aged 77. Eliza lived even longer, dying in 1923 at 84. To try and discover David’s parentage I looked at the 1861 census. He was there but as a lodger in the household of his brother-in-law and married sister, George and Elizabeth Gould. He was then single, aged 27, a plate layer born at Dinas Powis. So I looked at the census of 1851; again, David was there but this time as a farm servant, aged 17, at St Andrews, Glamorgan, a parish which included Dinas Powis. He was working for a 70 year-old widow called Mary Jones. I had to go to the 1841 census to find who David’s parents were and this time I was successful. The family were found at Dynas Powis (spelling of the name varied over the years) and David was aged seven, his parents being Charles and Eleanor Yorath. Charles Yorath was an agricultural labourer of 30 and his wife was 28 (ages were reduced in 1841 to the nearest lower multiple of five). Besides David, there were three other children aged from 9 to one. The 1851 census saw Charles and Eleanor Yorath at an address called Little Turnpike, St John, Cardiff. As mentioned, David was not at home, being a farm servant at St Andrews, but they had two daughters of 11 and 8 and a son of 2 with them. Charles Yorath was aged 41 and his birth place was given as Lantwit Major, a village near the sea a few miles west of Barry, and Eleanor’s birth place was shown as Cogan which is near Penarth, south of Cardiff. The two-year-old son was called Morgan Yorath, which suggests Eleanor’s maiden surname may have been Morgan. Charles and Eleanor Yorath were the 4x-great grandparents of Gabby Logan, Charles being born about 1810. To close this account of Gabby Logan’s family tree I will return to the maiden name of her paternal grandmother, Mary Sigallias. Hardly a Welsh surname, you would have thought? Well, no, it wasn’t. It first appears in the BMD indexes of the General Register Office for England and Wales with the death at Swansea in the last quarter of 1894 of a Nicholas Sigallias, aged 42, placing his birth date as about 1852. Who was he? I found him in the 1891 census as N. Sigallias with his wife, Sarah Jane. They were at 20 Herbert Place, Swansea, and his occupation was given as a fruiter, aged 36, his birth place being Syra, Greece. His age in the census and at death don’t quite tie up, but this is far from uncommon. Syra is a Greek island in the Cyclades group in the Aegean Sea, 78 miles south-east of Athens. At the website of the London Gazette, the official government newspaper of record, I found a notice saying Nicholas Sigallias of Swansea was granted naturalization on 20 February 1893. His entry is near the bottom of the page (see below). Also interesting was my finding that in 1891 the birth place of his wife, Sarah Jane Sigallias, 34, was given as ‘Savanah, America’. Presumably, this referred to Savannah, Georgia, in America’s Deep South. The couple had a son, Michael Sigallias, born at Swansea in the second quarter of 1893. After Nicholas’s death, Sarah Jane remarried in 1895 to a William Francis O’Bryan, but she is not found with him in the censuses of 1901 or 1911. An internet family tree at the Rootsweb World Connect Project records that a Nikolaos Dimitris Sigallias, of Syra, Greece, married Sarah Jane Farris at Charleston County, South Carolina, in April 1881. I have not been able absolutely to confirm this event but it seems possible. I had some e-mail correspondence with a relative of the Sigallias family and he told me that Nicholas may have been either a seaman or a merchant and may have arrived on a ship into Swansea that was importing timber from America. The relative also said it was known in the family that Sarah Jane retained a Deep South American accent to the end of her days. In 1901 Sarah and her son were in Cardiff at 6 Adelaide Street, St Mary. She was recorded as Sarah O’Brien, 43, a retired publican, and her birth place was given as ‘America, Naturalized English Subject’. Michael Sigallias, her son, was aged 8, born at Swansea. Also in the household was George B. Hugo, 32, a street musician born at Exeter. In the census of 1911 they were at 8 South William Street, Docks, Cardiff, with George Berry Hugo, whose age was now given as 47, still a musician; Sarah Jane Brien, 53, born in America, naturalised British subject; and Michael Sigalies [sic]. 18, a baker. This is an interesting entry for it suggests that Sarah was now living with George Berry Hugo, the musician, since it was he who completed the schedule, even though he was described as a boarder and Sarah the head of the household. A little white lie was told, for the ‘Particulars as to marriage’ column claimed they had been married 16 years when, in fact, I could find no marriage at all! To complete the picture, James M. Sigallias married Margaretta Geary at Cardiff in 1914 and their daughter, Mary M. Sigallias – Gabby Logan’s grandmother – was born in the first quarter of 1918. That Michael Sigallias and James M. Sigallias were the same man I have no doubt, for his death was recorded in both names on the same page of the GRO death indexes, with the same reference number, in 1967. A number of people called Sigallias were born in Cardiff and it seems likely that all of them descend from Nicholas and Sarah Jane Sigallias, Gabby Logan’s great great grandparents, and must therefore be related to her in a truly international family.